The instinctual desire to support those in need, irrespective of geographic, cultural or religious links, is both facilitated and overwhelmed by the extent of information now available about the multiple humanitarian crises which occur on a daily basis around the world. Behind the images of devastating floods and earthquakes, or massive forced displacements resulting from armed conflicts, is the all too real suffering faced by individuals and families. From the 2004 Indian Ocean Tsunami to the on-going conflict in Syria, recent years have seen an increasing debate regarding the international legal mechanisms to protect persons in such humanitarian crises. The International Legal Protection of Persons in Humanitarian Crises argues that an acquis humanitaire is identifiable through the interconnected web of existing and emerging international, regional and national laws, policies and practices for the protection of persons caught up in humanitarian crises. Indeed, the humanitarian imperative to alleviate suffering wherever it may be found permeates various branches of international law, and is reflected in the extensive humanitarian activities undertaken by States and other actors in times of armed conflict, population displacement and disaster. 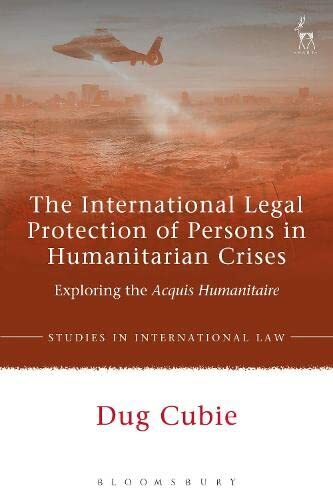 Dug Cubie argues that by clarifying the conceptual framework and normative content of the acquis humanitaire, gaps and lacunae can be identified and the overall protection of persons strengthened.